The family of the late Marlise Muñoz, a pregnant Fort Worth woman who in 2013 was kept on life support against her family’s wishes, asked state lawmakers on Wednesday to help prevent other families from going through similar trauma. In soft-spoken pleas, the family of the late Marlise Muñoz, a pregnant Fort Worth woman who in 2013 was kept on life support against her family’s wishes, asked state lawmakers on Wednesday to help prevent other families from going through similar trauma. Muñoz’s mother, Lynn Machado, described to the House State Affairs Committee the pain she felt watching her brain-dead daughter's body "decompose" while she was kept on life support for 62 days. At 14 weeks pregnant, Muñoz collapsed because of a pulmonary embolism and was nearly dead when her husband, Erick Muñoz, found her. After doctors pronounced her brain-dead, she was kept on life support because of a state law that requires doctors to maintain life-sustaining care for pregnant patients. A legislative proposal known as "Marlise's Law" by state Rep. Elliott Naishtat, D-Austin, would remove that requirement and allow pregnant women to be taken off life support. 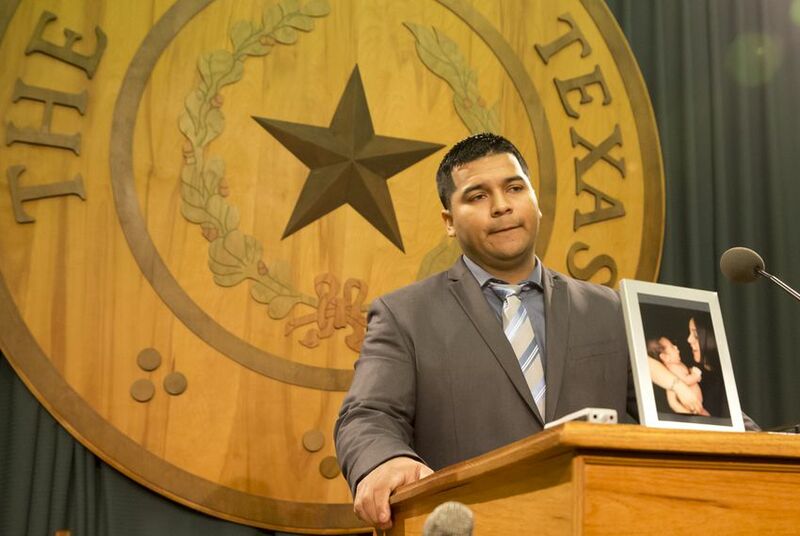 During the hearing, supporters of the bill, including Erick Muñoz, told the committee that the proposal would give families more control over their loved ones’ wishes. “Give families the opportunity to avoid the pain and suffering that my family” endured, Erick Muñoz said. But opponents of the bill asked the committee to weigh the value of a an unborn child’s life in keeping pregnant women on life support even if they are brain-dead. “We need to look and realize that it’s still the life of a pre-born child, and as Texans we need to protect those children regardless of the fact that sometimes that may be difficult,” said Cecilia Wood with Concerned Women for America. When she added that “it’s never okay” to follow the family’s wishes if “it takes away the life of the child,” state Rep. Sylvester Turner, Democrat of Houston, questioned what timeline the state should follow. “I’m trying to understand: At what point would it have been okay for her to have been disconnected from the life support?” Turner asked. Wood responded that a pregnant women should be kept on life support “until the child is no longer alive” or can be delivered. Naishtat’s proposal is one of two competing bills about who should have the authority to decide whether to terminate a brain-dead pregnant woman’s life. State Rep. Matt Krause, a Republican of Fort Worth, has also introduced a measure that is essentially the opposite of Naishtat’s bill. That proposal would strengthen the requirement that pregnant patients be kept on life-sustaining support, including in cases in which the patient is brain-dead. Several members of the committee expressed other concerns about keeping pregnant women on life support. State Rep. Jessica Farrar, D-Houston, questioned who should bear hospital costs for life support that is continued against a woman's advance directive. Rep. Charlie Geren, R-Fort Worth, made it clear that he wanted more medical information about the deterioration of a brain-dead pregnant woman’s body on life support. After public testimony ended, Naishtat said his bill only intended to change one line of state law so that women’s decisions about their end-of-life care will not be voided because they are pregnant.